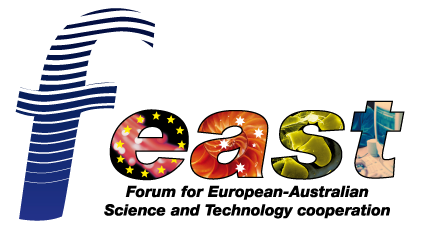 The Forum for European-Australian Science and Technology cooperation (known as FEAST) was an Australia-EU joint initiative that highlighted and promoted international research collaboration between Australia and Europe. It operated from 2001 until 2012. Archives of the FEAST website can be found on the Pandora Archive of the National Library of Australia: http://nla.gov.au/nla.arc-35648, and official project information (for the three iterations of FEAST) can be found on the CORDIS website: FEAST, FEAST phase II, FEED. A complete list of all FEAST publications can be found below. Individuals and institutions seeking information and support for collaborations with Europe — including funding sources and grant management — can contact Montroix Pty Ltd. They provide individualised consulting support, as well as training and literature relevant to European programs, particularly Horizon 2020. They are also contracted by the Australasian Research Management Society (ARMS) to deliver professional development for research managers regarding international funding programs. Below are a list of publications that were produced by FEAST. Merrilyn Fitzpatrick, Kerrie Glennie. Aus-Access4EU deliverable 1.8. December 2011. Rado Faletič, Merrilyn Fitzpatrick, Kerrie Glennie, Jean-François Desvignes-Hicks. FEAST Discussion Paper 7/11. June 2011. Merrilyn Fitzpatrick, Kerrie Glennie, Rado Faletič, Dennis Rank, Christopher T. Hill. FEAST Discussion Paper 6/11. April 2011. Rado Faletič, Jean-François Desvignes-Hicks. FEAST Discussion Paper 5/11. April 2011. Rado Faletič. FEAST Discussion Paper 4/11. February 2011. Paul Harris, Merrilyn Fitzpatrick, Kerrie Glennie. Aus-Access4EU deliverable 1.3. November 2010. Mark Matthews, Merrilyn Fitzpatrick. Aus-Access4EU deliverable 1.1. November 2010. Mark Matthews, Bev Biglia, Kerrie Glennie, Paul Harris. Aus-Access4EU deliverable 1.4. November 2010. Mark Matthews, Paul Harris. Aus-Access4EU deliverables 1.2 & 1.7. June 2010. Rado Faletič, Jean-François Desvignes-Hicks. FEAST Discussion Paper 3/10. May 2010. Mark Matthews, Bev Biglia, Bruce Murphy. FEAST Discussion Paper 2/09. November 2009. Mark Matthews, Bev Biglia, Kumara Henadeera, Jean-François Desvignes-Hicks, Rado Faletič, Olivia Wenholz. FEAST Discussion Paper 1/09. March 2009. Rado Faletič. International Innovation: Health. September 2012. Rado Faletič. International Innovation: Health. August 2012. Rado Faletič. The Australian. July 2011. Mark Matthews. Australian R&D Review. March 2010. Mark Matthews. Australian R&D Review. February 2010. Mark Matthews. Australian R&D Review. June 2009. Mark Matthews. Australian R&D Review. April 2009. Mark Matthews. The Australian. June 2008. Australia is in the southern hemisphere! Mark Matthews. Australian R&D Review. June 2008. Mark Matthews. Australian R&D Review. April 2008. Mark Matthews. Campus Review. January 2008. Mark Matthews. Australian R&D Review. September 2007. August 2012. EC Research & Innovation Infocentre. Rado Faletič. FEAST final public report. June 2012. Rado Faletič. 2011. Australian scientist: global leaders, international rising stars. Rado Faletič. Communiqué from the FEAST/UQ Symposium: Enhancing interoperability in the emerging global research order. April 2011. August 2010. Roxby Media Australia. Mark Matthews, Rado Faletič. March 2010. Mark Matthews. Innovation, 9:2, pp. 170-180. September 2007. Perhaps you came to this website looking for information about the other type of feast (e.g. food, banquet, degustation, festival, ceremony, etc. ), one of the movies (the horror film trilogy (2005, 2008, 2009) or the Disney animation (2014)), the Nestlé cat food product Fancy Feast, or the Adelaide Queer Arts & Cultural Festival. Or perhaps you are interested in the feast.org domain name domain name, which is available for purchase for the right price. In which case, make us a respectable offer (feast@montroix.com).